The one character that the new Fantastic Four reboot has kept under wraps is Doctor Doom, although production images have leaked out that do not fill me with confidence. This looks to be another cinematic outing where the character will not get his due, and that puzzles me. Look at Darth Vader, he's got the cape, armor, attitude and un-moving mask - and is considered to be one of the most iconic and cool villains in cinema history. There really is no reason Doom could not be realized on screen just as effectively. Yeah, Doom should make a great movie villain. I'll never understand why they always mess that up. And this is one of my favorite covers so far. 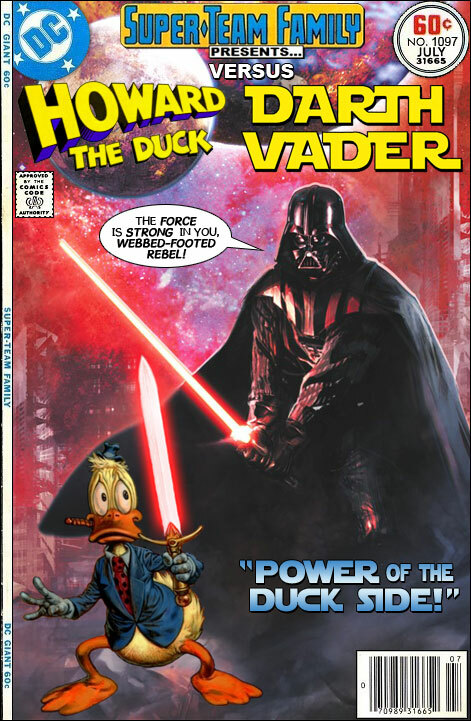 "DARTH VADER VS. DUCKTOR DOOM!" One of my favorite story arcs in the original HtD series was "Star WAAAAUGH!" in which Dakimh the Enchanter recruited Howard, Korrek, Man-Thing, and Jennifer Kale to stop the Imperium Emporium from buying the entire universe. Defending the Death Store were the Dearth Vapors, Donny and Marie lookalikes who could numb people's minds with the glare from their teeth. Then again, there's always Duck Vader -- a gag done many times, though never with the birth name that I favor: Anakin Skywaddler. Ah, yes...but see that was the gimmick. There was no star under the mask of Darth Vader. David Prowse is not a household name. neither was the actor that played the unmasked Vader/Anakin in Jedi. Vader's VOICE was the star. Young and Teen Anakin was slightly star. Try pulling that off these days. The odds are slim and none and Slim just left the room. Actually, the actor's name from Return of the Jedi was relatively familiar, just not in that context: Sebastian Shaw. On a related tangent, the going sensibility seems to be that one should never obscure an actor's face because that's what he needs to express emotion. We can do that even with an unmoving mask, however, even if only with body language -- something that David Prowse did very effectively, I think, in the RotJ scene where Palpatine is killing Luke.